I recently spent three days in training with mental health professionals at the Traumatic Stress Institute in Connecticut. Our trainers were experienced therapists who work for the Klingberg Family Centers which provides a wide array of programs for traumatized or abused children and youth. I went there seeking answers about healing traumatized youth and looking for connections that I could draw upon when training school administrators and staff. On the first day, what stood out immediately was the passion my classmates had about their work with traumatized youth. Most of these professionals work directly with children either in group homes or foster homes providing counseling and support. The daily difficulties and nature of their work with children who are severely traumatized or suffering from mental health problems was daunting to me, and yet they emphasize how important their empathy and constancy is with this high-need population. I was deeply moved by their commitment to these children. In public education in NYS, we have made some baby steps in training school personnel on Mental Health First Aid Awareness, but schools should not stop there. School personnel need insight beyond awareness so that our actions and responses sustain a positive learning environment for every child we teach. Many teachers have heard of the positive impact of mindfulness activities for students. However, mindfulness activities in isolation of understanding of trauma’s impact means that progress gained in mindfulness is quickly unraveled by mistakes made that trigger dysregulation in our students. Mindfulness truly helps students, but is not nearly enough help for children with trauma. 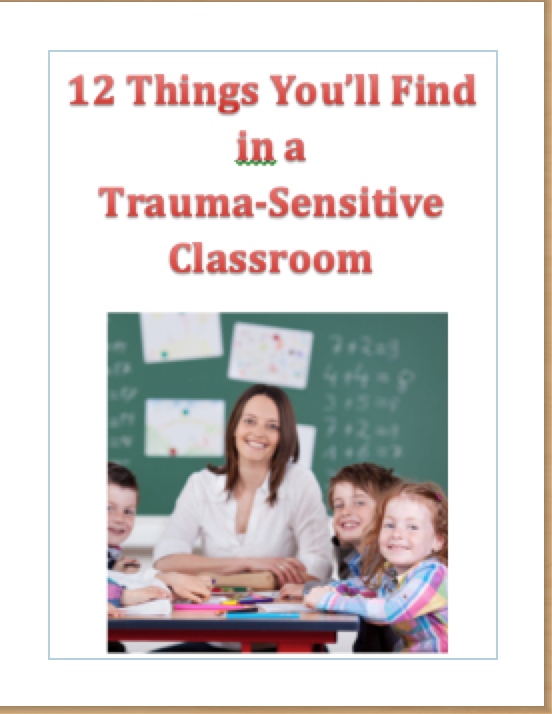 My goal in this training was to learn how therapists work with children on the extreme end of the trauma spectrum. I left the shallows of mindfulness and waded into the deeper, darker waters of trauma recovery. Here’s what I learned. Trauma disrupts all three areas of a child’s normal development: Attachment, Body/Brain, and Self-Capacity. These three basic building blocks in early childhood are essential for all healthy human connectedness. When adults understand these, it is possible to help another overcome trauma, build the trust necessary for healing to occur and help positive, healthy relationships to take root. Attachment is an innate biological response to stress. Babies depend on this to communicate their needs and survive. Attachment also requires a responsive caregiver. I thought of what my training in child development classes (years ago) referred to as “bonding” between the parent and infant. Attachment is more inclusive of the parent behaviors and interactions with the child. One such interaction is called “serve and return”. The baby coos and smiles, the parent responds by making eye contact, smiling, bringing her face closer to the baby and reacting to the baby’s action with touch or sounds. To the parent this feels like play, but for the baby, important neural pathways are being formed during “serve and return”. The baby is learning his behavior elicits a response. This process of learning, called Attunement, with a caring and responsive adult, promotes a sense of security and calms the child. The flip side of this called “rupture and repair”. When an infant cries indicating his distress, an attuned caregiver not only determines the cause, but her presence and touch soothes the child and “repairs” the child’s state of dysregulation. This process occurs thousands of times during normal development and is the foundation of a child’s ability to trust and be comforted by an adult and develops basic skills to regulating their own distress. What is important to note when an infant lacks an attuned caregiver, the infant’s developing neural pathways adopts a learned response based on the absence of “repair” or “return” from a nurturing and consistent caregiver. What is learned and set into early development interferes with normal self-soothing and trust. When trauma is experienced as well as the absence of an attuned caregiver, the impact short-circuits the child’s ability to derive comfort from caregivers. This child is less likely to seek support when they need it, instead resorting to self-coping skills discovered on his own. In spite of this, there is hope. Because the brain is constantly rewiring neural pathways, it is possible to turn things around. With the support and care from an attuned adult, trauma can be ameliorated. The impact of trauma affects both the body and the brain. The ACEs study by the CDC has documented the powerful affect. But in this training, I learned more about the immediate effects and the individual’s coping mechanisms in response. For a person without trauma, there is a window of tolerance within which the individual’s limbic system is activated then calmed. This is a normal alertness function all humans have. For a person with a malfunctioning threat response, perception of a threat and the reaction is out of proportion because his window of tolerance has shrunk. The highs are too high (Hyperarousal) and the lows are too low (hypoarousal). The physical symptoms of hypervigilence may be stuck in “on” and the child struggles to relax, sleep, or have fun. The low responses can include numbness, lack of eye contact, withdrawal, and unresponsiveness. The third area of development that is disrupted by trauma is the ability for the individual to stay connected to and grounded in one’s sense of self, even when experiencing strong feelings. This is called Self-Capacities of which there are three. The first is the ability to maintain an inner connection to others, even in physical absence. When this capacity is well-developed, the individual can still function and feel secure. When inner connection capacity is impaired, the individual has extreme reactions to small separations and may choose extreme behaviors to keep others engaged and avoid separation. Picture two 5-year-olds on the first day of kindergarten. One child is crying and clinging to mom for more than five minutes, while another child says goodbye then soon is playing calmly. The second self-capacity is having a sense of self-worth, of being worthy of life. An impairment of self-worth results from a feeling of shame. This person sees himself as unloveable and on the extreme end of impairment, may in fact behave in a way to push away others to “prove” how unworthy he is. In a classroom setting, this behavior is truly disconcerting for a teacher who is trying to form a positive connection and show kindness and empathy. The shame-filled student may come across as insubordinate and hostile. The third self-capacity is the ability to manage oneself when experiencing strong feelings. Staying grounded and managing ones feelings involves recognizing physical differences between distress and calm, being able to verbally name the feeling when distressed, being able to use coping strategies and expressing ones feelings constructively to others. Children learn or fail to learn these skills from the adults closest to them. When the adults exhibit self-regulation, children learn to emulate that. For some children, their teacher may be the only self-regulated, caring adult they know. How we model self-regulation and respond to a problem is immensely important for all the children in our classrooms. Attendees in my workshops learn how to recognize and respond to student behaviors in appropriate and highly effective ways. Managing our interactions with students makes all the difference in resolving problem behaviors in a school setting. Teachers, bus drivers, support staff, principals, and substitute teachers consistently trained in working with students using a trauma-informed practice make a positive, life-changing difference for all students. Want to know more? Have your District, Teacher Center, or BOCES contact me. I can bring my workshops to your staff or provide in-depth trauma-informed consulting services and ongoing training to your site. Check out my workshops described here.